Get 5 for the price of 4! 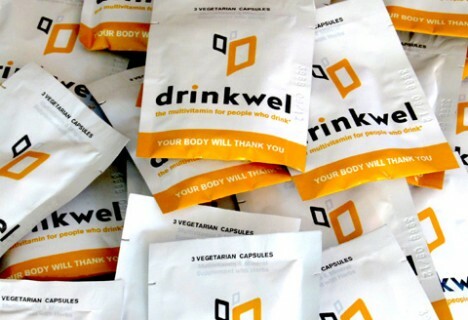 We believe that the world is full of healthy people who still like to have a good time, which is why we created drinkwel: the food supplement with multivitamin for healthy people who drink. Newly reformulated for the United Kingdom, drinkwel is not your typical multivitamin, it’s loaded with antioxidants, amino acids, vitamins, minerals, and our proprietary fruit & botanical extracts blend. Created by two UC Berkeley graduates and formulated by two doctors, a PhD in Biomedical Science and a Doctor of Naturopathic Medicine, drinkwel’s unique combination of ingredients replenishes nutrients, helps immune system function, plays a role in energy-producing metabolism and may help support the protection of cells from oxidative stress. On the Go all the time? Perfect for traveling or sharing with friends the 6 capsule To-Go sachets allows you to bring multiple servings of drinkwel with you, wherever you may go. We believe that the world is full of healthy people who still like to have a good time, which is why we created drinkwel:The food supplement with multivitamins for healthy people who drink.